Turmeric is a rhizome with edible roots that grow underground horizontally, and is related to the ginger, spice, which it somewhat resembles in appearance. Lately turmeric has been acknowledged as a strong anti-inflammatory, antioxidant, and anti-cancer substance, giving it new importance in many health fields, especially pharmaceuticals and nutrition. Curcumin, turmeric's active ingredient, is often extracted from the rhizome and used in many clinical studies for cancer treatment and chronic inflammation, including rheumatoid arthritis and cystic fibrosis. Recent studies have shown that various types of chronic inflammation are carcinogenic, meaning curcumin’s super-healing properties are crucial for fighting against these diseases. 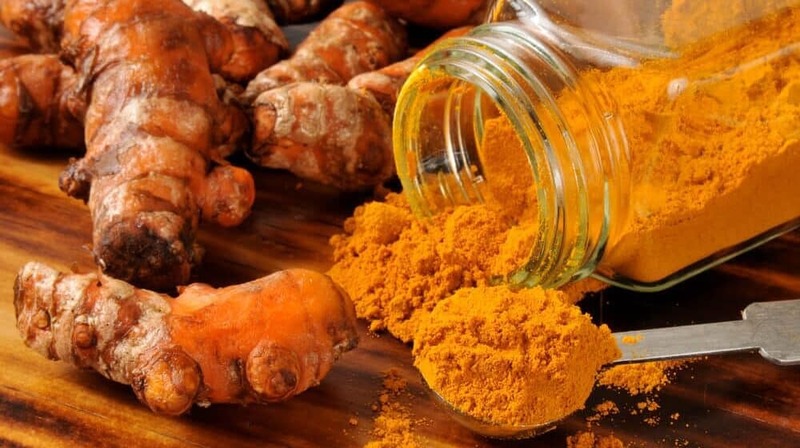 Besides cancer and cancer-inducing chronic inflammations, turmeric and its curcumin have many other health benefits, including reducing the risk of pediatric leukemia in children, improving liver function, boosting protection against cardiovascular diseases, lowering cholesterol, and helping to prevent or reduce the symptoms of Alzheimer’s and other similar neurodegenerative diseases by crossing the blood-brain barrier and boosting amyloid plaque clearance. And just like there are many different health benefits, there are many different ways to enjoy turmeric as a spice to improve the taste and quality of your meals, and add its active ingredient, curcumin, as a daily part of your diet and body's biological chemistry. Regardless of recipe differences or cooking preferences, keep in mind that in order to get the maximum curcumin absorption from turmeric, three basic elements are required. These three basic elements are cooking heat, a touch of black pepper for the nutrient-absorbing chemical called piperine, and any healthy fat of your choice to protect the turmeric's curcumin from stomach acids before entering the small intestines. “Healthy” fats? Yes, there is such a thing as healthy fats. You can choose one or two fats from the following cold-pressed or organic fat sources: Ghee, almond oil, olive oil, coconut oil, coconut milk, almond milk, or goat’s and cow’s milk. Unfortunately, soymilk and canola oil, sometimes referred to as vegetable oil, are not the healthiest fatty choices. Add turmeric to spice up your rice dishes and make them healthier for your body’s natural healing and defense systems. Adding turmeric is especially appropriate for organic white basmati or Indian parboiled rice. Parboiled white rice is a typical Indian food dish, and is nutritious and easily digestible enough to be recommended by Ayurvedic doctors. It is also worth noting that Asian rice generally contain less arsenic than domestic American rice. But remember to make sure that the rice isn't overcooked or soggy before lightly stir-frying it in a suitable pan with a cold-pressed organic oil of your choice, sprinkled with black pepper. Then, add some chopped cilantro and/or whatever salivates your taste buds desire for an excellent, tasty, and nutritious super-healing meal! Eggs are shock full of nutritional value and benefits, including the super-healing turmeric. Eggs can be fried or scrambled using butter or coconut oil with a generous sprinkling of turmeric and even sea salt. And don't forget the pepper! Whether it’s a quick, healthy breakfast in the morning or added on your salad or sandwich, eggs are an excellent and easy to prepare daily source for turmeric. Spicy lentils are a great source of turmeric. Use green or brown lentils that can be cooked in roughly around thirty minutes with a two-to-one liquid-to-lentil ratio. You might want to try organic vegetable stock instead of purified, fluoride-free water for when you’re preparing the spicy lentils. Then, when the lentils are nearly finished, lightly stir-fry the turmeric powder in either ghee or coconut oil. Finally, mix the turmeric and oil with the lentils and some black pepper. You will have a delicious, spicy, and super-healing meal in no time that both your palate and your immune system will enjoy! Chick peas and various types of beans are also great sources for turmeric and its super-healing organic properties. You can create many nutritional, turmeric-rich dishes using chick peas or garbanzo beans. If you use canned garbanzo beans, then make sure they are the organic kind and that the cans are labeled BPA-free. But it’s healthier and cheaper if you don’t use canned garbanzo beans and just simply soak-dry bulk organic chick peas in pure water overnight and then boil them around 30 minutes. Either way, you should coat the chick peas with plenty of turmeric powder, black pepper, and some sea salt mixed with any organic, cold-pressed, healthy fatty oil you choose. Then, you should lightly roast the mixture on a medium-level heat setting on your oven for roughly somewhere between 15 and 20 minutes. Of course one of the best ways to get a healthy, significant amount of turmeric and its healing properties, including curcumin, would be to go straight to the source: the turmeric root. A turmeric concoction perfect for cooling down over the summer while helping to strengthen your body’s immune system against cancer and chronic inflammation can be prepared by first boiling some turmeric root, then letting it cool down somewhat before discarding the root and adding honey, lemon or lime, with a dash of ground turmeric and, of course, a pinch of black pepper. Pour the concoction in a nice glass filled with ice and enjoy sipping it on your front porch or while you’re on the go. Your taste buds and your body will love it. If the turmeric root concoction doesn’t appeal to you as a summer drink that’s both tasty and healthy, then why not try a classic smoothie? You can create a tasty and turmeric-rich smoothy by blending either half or a whole banana with some grated or powdered ginger, raw honey, freshly squeezed lemon juice, a teaspoon of bee pollen with two teaspoons of turmeric paste, which can be made by stirring turmeric over heat in ghee or coconut oil and, of course, a dash of black pepper. Then, blend with activated almond milk. You can learn how to make activated almond milk here. Speaking of turmeric paste, here is a simple, easy, and convenient way to ensure you are receiving your daily, balanced dose of turmeric. Watch this video to learn how to prepare a turmeric paste that you can refrigerate for several days and use to quickly prepare what is called “golden milk”. Although turmeric is already present in curry, another popular and common Asian spice, turmeric by itself can also be added to dishes already containing curry. Also, onions, when paired with turmeric, are especially helpful in preventing colon-related cancers. A liberal usage of turmeric in either curry- or onion-containing dishes, or dishes containing both ingredients, can have a dramatic effect in preventing cancers like colorectal cancer. Turmeric is a delicious spice when added to nutritious Asian dishes sprinkled with curry, sea salt, olive oil, and black pepper or steamed and sautéed onions. Also try your hand at creating flavor-rich yet low-calorie dips, or mixing turmeric and dried onions in a yogurt for a healthy afternoon snack. Recent research has shown that cruciferous vegetables like cauliflower go great with turmeric’s curcumin to create a therapy that’s highly effective in preventing various cancers, particularly prostate cancer. To prepare cauliflower with turmeric, you can cut florets of cauliflower in quarters and let them sit for around 5 to 10 minutes, then sprinkle with turmeric powder or paste before sautéing them on medium heat on your oven with a few tablespoons of vegetable or chicken broth for around five minutes. Then, remove them from the heat and top it all off with a mixture of olive oil, sea salt, and black pepper. Another tasty and healthy way to prepare cauliflower with turmeric dishes is by cutting the cauliflower florets in half and sautéing at the appropriate heat level on your oven with a generous amount of turmeric powder or paste for roughly around five minutes. Then, remove the pain from the heat on the oven and toss the cauliflower-and-turmeric mix with olive oil, sea salt, and black pepper for extra taste and nutritional value. It is important that you cut the florets of cauliflower and waiting between five or ten minutes before beginning to cook them with the turmeric and extra ingredients, because once the cauliflower is cut, and during that 5-to-10 minute wait period, phenthyl isothiocyanates, a chemical property in cruciferous vegetables like cauliflower which has natural healing benefits like turmeric, begin to be produced, but this production stops once the cruciferous vegetables begin to be heated. Didn’t think you could make your salad any healthier? Think again. You can make your salad richer in turmeric and its super-healing properties by adding and mixing it with your salad dressing. Sabrina Wilson is an author and homemaker who is passionate about a holistic approach to health. When she is not writing she can be found tooling around in her garden with the help of her appropriately named dog Digby, bicycling in the park, and occasionally rock climbing…badly. Sabrina is a staff writer for the Organic Daily Post.